Reference number for this case: 18-oct-54-Moyaux. Thank you for including this reference number in any correspondence with me regarding this case. 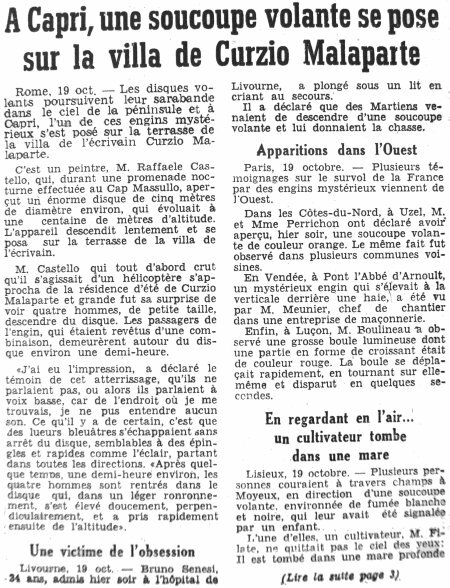 Reported as a funny story in the Press on October 20, 1954, there was reportedly a flying saucer sighting in Moyaux in the Calvados on October 18, 1954. The case was reported from Lisieux, on October 19, 1954: several people had run across fields in "Moyeux", in the direction of a flying saucer, surrounded by white smoke; which had been reported to them by a child. One of these people, a farmer, Mr. Filate, did not cease looking at the sky and fell into a deep pond where he almost drowned. His companions managed to save him. where he nearly drowned. His companions managed to save him. Bonn, Oct. 19. -- No matter what happens, don't shoot at the flying saucers. They should be approached in a charitable spirit, wrote Phillipp Dessauer, German theologist, in the catholic magazine "Wort und Wahrheit". Professor Dessauer, deploring the skeptical attitude of the American Air Force who studied without enthusiasm the reports on the flying saucers, states that it is a bad policy to refuse to consider unexplained phenomena that this policy is likely to unchain panic if the existence of the saucers is confirmed. One day, he says, the appearances of saucers will multiply and these machines will be probably land on earth. "The governments should consider that they have the duty to prepare their people to such an encounter". Do "planetids" have a weapon? Professor Dessauer wonders why the saucers did not land yet. Perhaps, he says, their occupants tried to come in contact with us and were not understood. Perhaps want they to observe the earth before landing. If this is the case their observations of the Korean war certainly did not encourage them to approach us in confidence. It may be also that there are technical reasons preventing the saucers men (the professor calls them "planetids") from landing. In any events, professor Dessauer estimates, the planetids can come only from Mars or Venus, the other "possible" planets being at four light-years from the earth. On Mars the force of attraction reaches only 38% of that of the earth and the air is less dense there. Perhaps the planetids seek to try out devices to be able to support life on earth. Professor Dessauer also wonders: are planetids mortal and do they have weapons? They must be thinking creatures, for they reached a high technical level. They must be mortals because judging from the care they take to avoid the planes of the men they must know what danger is. They do not seem to be spirits or demons for they are subjected to physical limits and need technical means. Rome. -- The flying discs continue their dance in the sky of the peninsula and, in Capri, one of these mysterious craft landed on the terrace of the villa of the writer Vurzio Malaparte. It is a painter, Mr. Raffaele Castello, who during a walk at Cape Massulo, saw a huge disc of five meters in diameter, which was flying at a hundred meters. The craft slowly descended and landed on the terrace of the villa of the writer. Mr. Castello, who initially thought it was a helicopter, approached the summer residence of Curzio Malaparte. Great was his surprise to see four small men get down of the disc. The passengers of the vehicle, who were dressed in overalls, remained around the disk for about half an hour. "I felt, said the witness of this landing, that they were not talking. Or else, they spoke softly, because from where I was, I could not hear any sound. "What is certain is that bluish glow escaped without stopping from the disc, like pins and as fast as lightning, going in all directions." The four men returned to the disk; which in a gentle purr sound, rose slowly, perpendicular, and then quickly took altitude. Lisieux. -- Several people ran through fields, in Moyeux, toward a flying saucer, surrounded by red and white light; which had been reported to them by a child. One of them, a farmer, Mr. Filate, only watched at the sky; he fell into a deep pond where he nearly drowned. His companions were able to save him. The author indicates that on October 18, 1954, in Moyaux in the Calvados, "one does not know what they saw." He indicates that only Paris-Presse for October 20 mentions this case without giving even one detail, that it is impossible to go up to the source and not even possible to check the date. The website indicates that on 18 October 1954 at 17:30, in Moyaux, France, "An unidentified object was sighted, but with appearance and behavior that most likely would have a conventional explanation. One object was observed by one witness." The sources are indicated as Michel, Aime, Flying Saucers and the Straight-Line Mystery, S. G. Phillips, New York, 1958; Vallee, Jacques, Computerized Catalog (N = 3073); Schoenherr, Luis, Computerized Catalog (N = 3173); Falla, Geoffrey, Vehicle Interference Project, BUFORA, London, 1979. There is obviously not enough information on the said "saucer" to evaluate what it was. 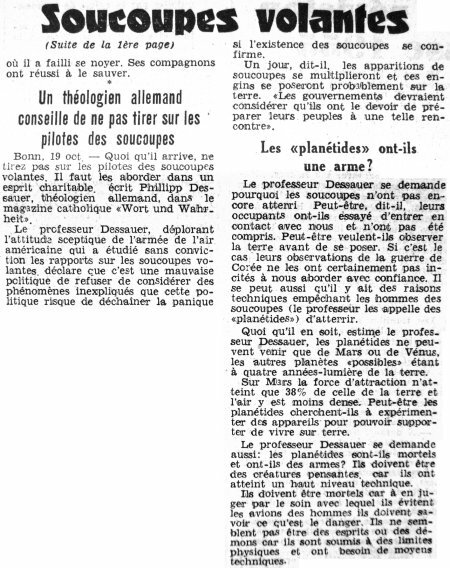 [hm1] Article in the regional newspaper Le Haut-Marnais Républicain, Chaumont, France, October 20, 1954. 1.1 Patrick Gross June 8, 2010 Addition [la1]. 1.2 Patrick Gross September 22, 2014 Addition [hm1]. 1.3 Patrick Gross December 15, 2016 Addition [ub1]. 1.4 Patrick Gross January 19, 2019 Addition of the Summary. Explanations changed, were "Not looked for yet."